Is the Illuminati sending us a message of coming events? 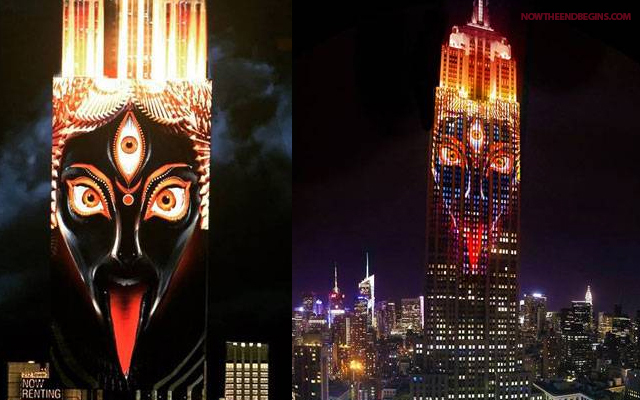 The Times of India reports today that “In a breathtaking spectacle, Goddess Kali was projected on the Empire State Building in New York.” For those of you not familiar with the Goddess Kali, she is the Hindu god of death and destruction. The name of Kali means black, time, death, lord of death; she is therefore called the Goddess of Time, Change, Power, and Destruction. She is known as the “Black One”, or the “Dark One”. We wonder if perhaps this is not an Illuminati message of coming events soon to take place? Please note that we do not endorse or agree with the announcement of the Rapture in September shown at the end of this video. It certainly could happen then, yes, but we make no claims to know the date.